Traditional design wasn’t quite right for a couple with three young children. Their color-happy designer was up to the task. Will and Lindsey Burghardt with children Tess, Emmett, and Harris in front of their Greek Revival home in Duxbury. Lindsey and Will Burghardt found their dream house on their way home from the shore. 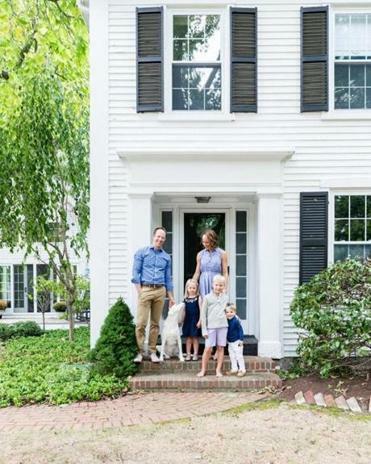 After a Duxbury Beach excursion with their children, now ages 2, 4, and 7, they passed a stately white clapboard house with black shutters — and a “For Sale” sign in front. “We liked Duxbury a lot and had talked about how nice it would be to live there,” recalls Lindsey. It wasn’t long before the couple were exploring the interior. While they were drawn to antique homes, they didn’t like the choppy layouts common in historic architecture. Fortunately, an expansive renovation had been done several years earlier that reworked the configuration of the 19th-century home. 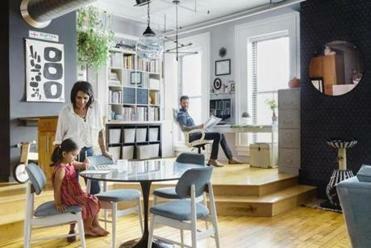 Married designers with a young daughter combine sophisticated residence and child-friendly workspace in their open-plan space. Bourque started with the living room, using a neutral scheme based on photos Lindsey had pulled from magazines. “It turned out beautifully, but after it was done, Lindsey realized it wasn’t really what she wanted after all,” says Bourque. “It sort of looked like it belonged in a house with a couple who doesn’t have kids.” After that, Lindsey let Bourque run with the project. The house is now an eclectic mix, says Bourque, each room a different color with a distinctive character. In the den, the whole family piles together to read or watch movies on a new green velvet sofa. 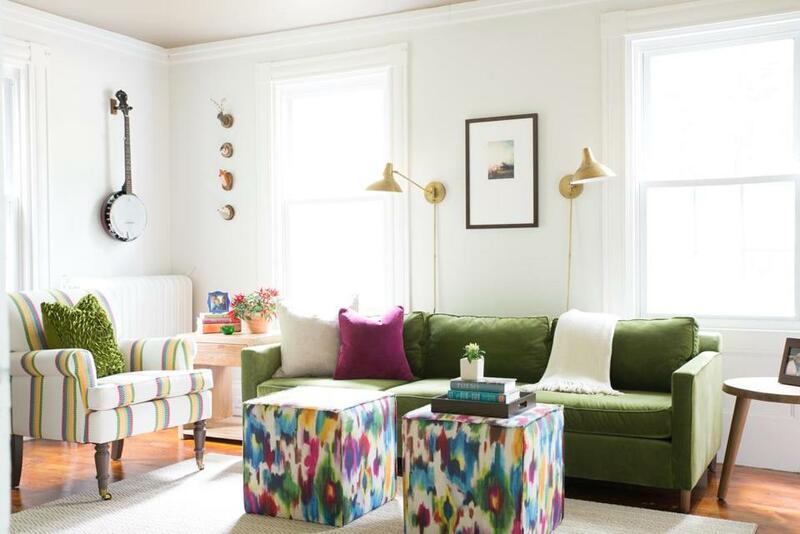 Multicolored ottomans were selected for their durability. “Kids use the room, so there is no way they aren’t going to get dirty,” says Bourque. “But with the busy print, they still look fantastic even when they have some stains.” A banjo on the wall alludes to the music the family enjoys playing together. Upstairs, blue dominates the extra-large master suite. Decorating the expansive space was tricky. To make it feel cozier, Bourque opted to paint the walls a deep navy; the wall behind the bed is covered with a Serena & Lily paper in a blue, white, and orange print. “They have a queen bed, and it seemed very small against the large wall, so the wallpaper provided a focal point,” says Bourque. Wall-mounted sconces above the bold orange night stands by Wisteria take up more of the space than table lamps would. Bourque worked to stretch the budget, selecting most of the home’s furnishings from retail sources, not high-end designers. “I looked for things that were right for a young family as well as for the architecture of the house,” she says. For example, while at the flea market at the Marshfield Fair, an antique pedestal table in rough shape caught her eye. One of the most appealing things about the home is that it has lots of spaces that accommodate the whole family, but there are also spots that are personal to each member. Tess and Emmett color while Will preps a meal. 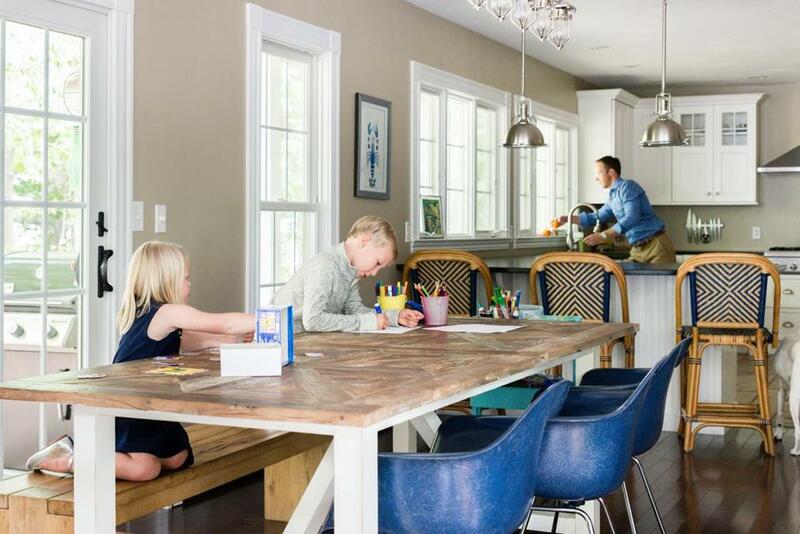 The Restoration Hardware kitchen table has a rustic wood top, and the blue chairs are from Design Within Reach. A large part of the home’s appeal was its open floor plan. “I love how I can be cooking in the kitchen and the kids are right nearby,” says Lindsey. 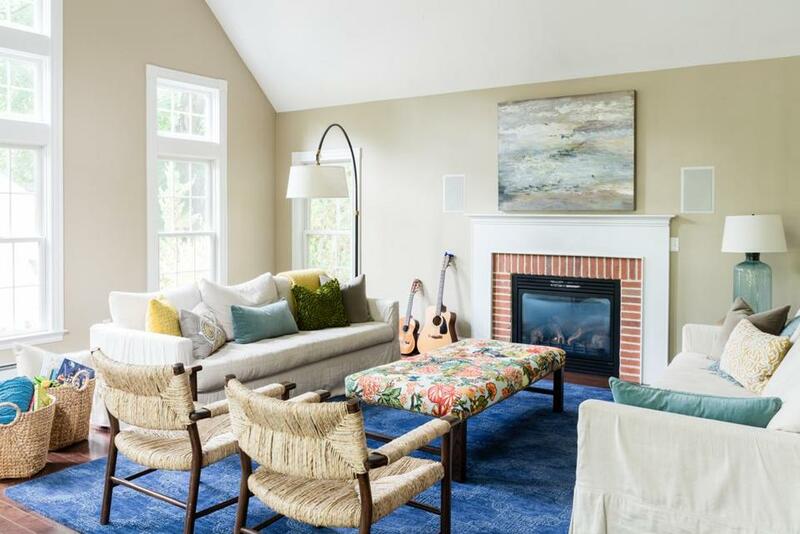 To liven up the neutral living room, designer Beth Bourque introduced a navy blue rug and a bench upholstered with a vibrant Schumacher fabric. On the linen slipcovered sofas, throw pillows in a mix of hues draw the eye and add textural interest. In the den, the striking green velvet sofa complements a custom chair upholstered in Lee Jofa striped fabric and grounds colorful ottomans from Wayfair. 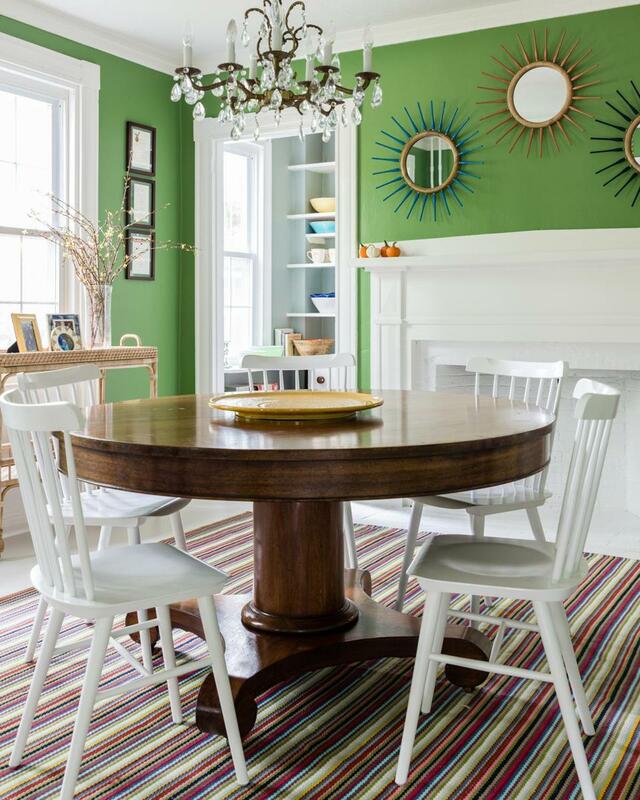 The dining room table, paired with Serena & Lily chairs, was a flea-market find that Bourque had refinished. The indoor/outdoor rug is by Dash & Albert, the mirrors are from Pottery Barn, and the chandelier is vintage. Jaci Conry is a frequent contributor to the Globe Magazine. Send comments to magazine@globe.com.